Pre-race favourites Cambridge made good on their status to utterly dominate The Cancer Research UK Women’s Boat Race 2018. Umpire Sir Matthew Pinsent dropped his red flag and the crews set off into their high-rate starts. Oxford, wary of their issues from last year, were a little cautious and Cambridge took full advantage, stretching out to half a length after 20 strokes. Coming along the Putney boathouses, the Light Blues were already straining against the leash to break contact. They held this advantage as the crews settled into their race rhythms. Despite the bend in Oxford’s favour on the Middlesex side of the river, Cambridge’s livelier race rhythm help them to extend their lead to over a length going past the mile post point in a time of 4:06. Now Cambridge had the freedom to choose which line to take. Cambridge continued to build on their lead and were 3 lengths up coming underneath Hammersmith Bridge. It was clear by this stage that it would take a monumental effort for Oxford to recover the deficit. Oxford cox Jessica Buck tried her best to limit the lead that Cambridge had by trying to take a shorter line on the inside of the Surrey bend. However, the Light Blues continued to move away and began to build for the finish line underneath Barnes Bridge with a lead of 6 lengths. 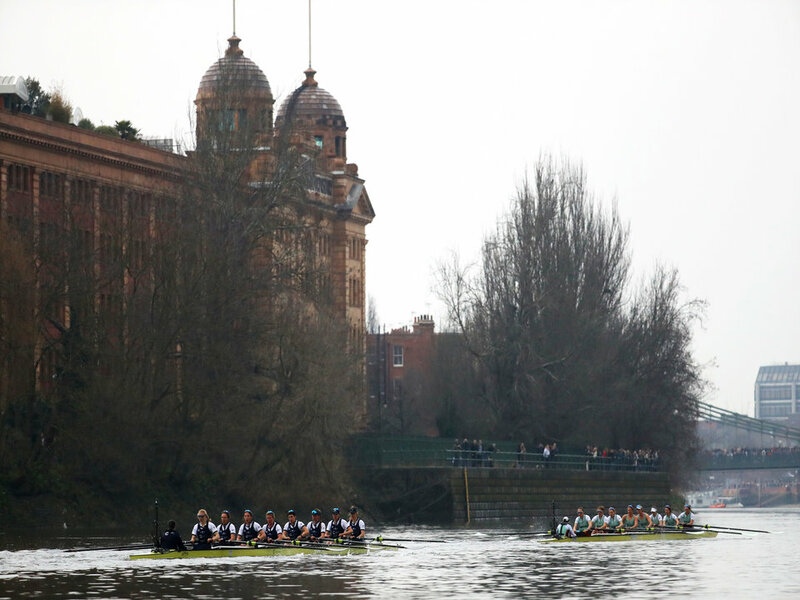 Cambridge’s time to Barnes Bridge was 15:47, 25 seconds off the record set by last year’s crew.